Screen shot of a Library Everything Search for "Michigan"
On July 30, 2018, we made the University of Michigan Library Search interface the discovery interface for library resources at the U-M Library. It replaced several previous tools and brands including Mirlyn (the former catalog), ArticlesPlus (our Summon-powered article discovery interface), Search Tools (our journal and database finder), and our previous bento box-style single search. (Mirlyn Classic, the interface that is part of our Library Management System, is still available.) Our goal was to unify the user experience for our various search interfaces, provide a modern technological platform for our discovery interface, and improve accessibility and usability for all our users. We are very pleased with the results, and from feedback and ongoing usability testing, our users are, too. Added alphabetical and subject browse features for journals and databases. 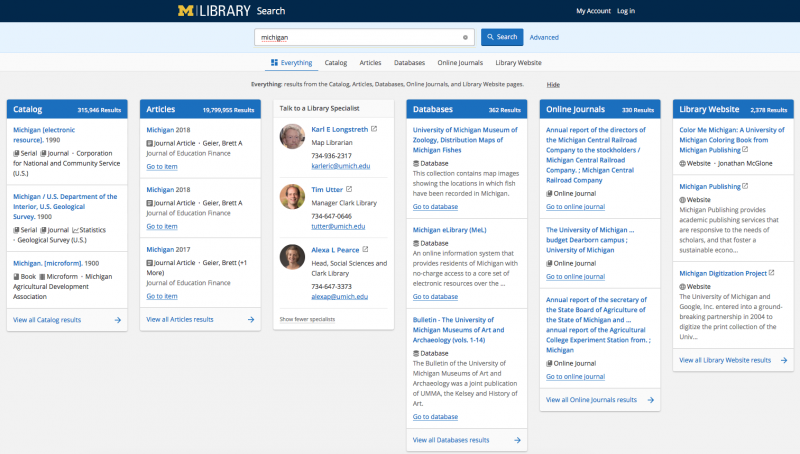 We continue to work on some additional features and functionality to integrate Library Favorites -- our tool for saving resources into user’s library accounts for later use -- and to expand the range of library specialists who appear in search results in August, before U-M faculty and students return to campus in force after Labor Day. This has been a huge effort involving many people. I would like to make special mention of the team in LIT’s Design & Discovery unit who have spent huge amounts of their professional lives over the past year on this effort: Albert Bertram, Heidi Burkhardt, Jon Earley, and Ben Howell.